The new Canon IXUS 220 HS enters the market with a 12.1MP resolution, 5x zoom lens with an equivalent focal length of 24-120mm and stabilisation technology. It also has Full HD movie mode, program, scene and creative shooting modes and a high-speed burst rate that boasts eight frames per second. Priced at a reasonable £199, the compact positions itself neatly in line with the brand's current IXUS portfolio and looks set to contend with several higher-end, higher-priced compacts from rival manufacturers. 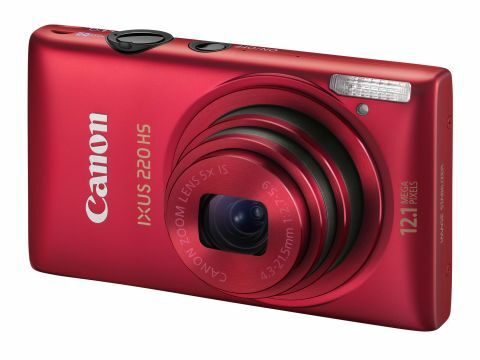 The Canon IXUS 220 HS caters for a wide demographic of user with its healthy supply of shooting options. For the beginner shooter there is a Smart Auto feature that instantly detects from 32 different scenes and installs the optimum settings for each, whereas for the creative enthusiast we find a catalogue of inspired filter effects including our particular highlights: Fish-eye, Miniature, Toy Camera, Monochrome, Color Accent, Color Swap, Poster and Super Vivid. A full HD movie mode with crystal clear stereo sound and Dynamic IS to stabilise against shake is supplied; offering full HD 1920 x 1080 at 24fps, or HD 1280 x 720 at 30fps. Additionally there are a range of intriguing movie mode creative controls, including the ability to slow down movement up to 1/8th of the real speed using Super Slow Motion Movie mode and Movie Digest, which captures up to 4-seconds of the action before a shot is taken, joining all the clips together into a single VGA movie. For those craving manual control, shooters can alter a series of options using Program mode, including: drive mode, metering, colour, white balance, ISO and self timer, which compared to its peers is actually an exciting and extensive array of variables to exploit. More importantly perhaps, these options offer up an explanation of their purpose and thanks to the enhanced resolution of the LCD, users can instantly see the effect of utilising them, ensuring that the device will make a fantastic choice for novices who want to increase their understanding of basic photography principles such as metering, white balance and exposure. Elsewhere we enjoyed the camera's impressive high-speed burst mode of 8 frames per second, however were slightly disappointed that these were delivered at a maximum resolution of just 3MP. The camera's accompanying manual suggests the battery life should extend to 220 images and after our rigorous testing we'd agree that this is certainly viable.